I don’t know if it’s my love for crochet that feeds my love for yarn, or if it’s the other way around – regardless, I do love yarn. In my 5 Foundation Chain Tips for Beginners post, I showed you that a yarn’s label will tell you what crochet hook size is recommended for that skein of yarn. Did you wonder what all the other things meant, too? In this post, I’ll go over 7 bits of information that can typically be found on a yarn label. Label from Vanna’s Choice yarn from Lion Brand. This label even has ruler markings along the side (cool)! 1. Weight: Not only the net weight of the skein (ounces or pound) but also weight of the strand of yarn. This will usually run from 1 (lace) to 6 (super bulky). You need to make sure to use the correct weight yarn that your project calls for. 2. 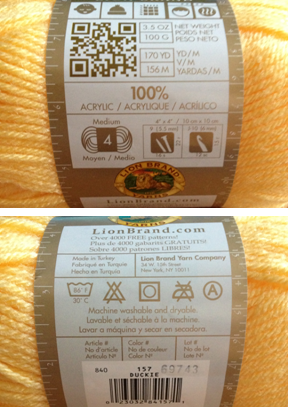 Yarn Composition: The label will tell you if your yarn is acrylic, cotton blend, or wool blend. This yarn is 100% acrylic. 3. Number of Yards: It’s important to know how many yards a skein will give you. Will one skein be enough for your project, or will you need to get two, or three? Personally: I would rather have too much yarn than not enough; especially if the yarn has a lot dye number (to be discussed later). 4. Needle Sizes: Whether you are going to be knitting or crocheting, the label will give a recommended needle size for each. In this label, the recommended hook size is J-10 (6mm). 5. Swatch Size: A swatch is a square that you knit or crochet using the stitches recommended on the label. Based on those stitches, your project should measure what the label indicates. In this example, you are being instructed to stitch 12 stitches across and 15 rows up. This swatch should measure 4 inches by 4 inches. If your swatch measures bigger, you need to use a smaller hook. If your swatch is smaller, you need to switch to a bigger hook. 6. Dye Lot Number: Because not all yarn is created equal, the dye lot number is extremely important if you’re going to need more than one skein of yarn for your project. If skeins of yarn have the same dye lot number, this means that all of the yarn with the same number was dyed in the same vat. If you ignore using yarn with the same lot number, you will end up with a project that has slight color variations even if all of yarn is the same color. In this label example, I will need to make sure that all of my yarn for the same project is not only color “Duckie” but also from dye lot number 69743. 7. Wash Care Instructions: Most of the icons on the label will refer to the wash and dry care of the yarn. Sometimes the instructions will be written out but you should become familiar with the icons as well. You can visit Textile Industry Affairs’ website for a list of the most common care symbols. For this yarn, from left to right, the icons tell us: machine wash with warm water, do not use bleach, normal dryer setting, do not iron, and can be dry-cleaned with any solvent. So go on. Tackle those yarn labels!